Do you know what a Protestant B is? I know what a Protestant is, and I know what a Catholic is, and I know what a Jew is . . . but until recently, I had never heard of a Protestant B.
I learned what a Protestant B is from an essay by Debra Darvick that appeared in an issue of Hadassah Magazine. It is a chapter from a book she is working on about the American Jewish experience. And this essay is about the experience of retired Army Major Mike Neulander, who now lives in Newport News, Virginia, and who is now a Judaic silversmith. This is his story. Then, as now, Jews were forbidden by Saudi law to enter the countryDog tags. When you get right down to it, the military’s dog tag classification forced me to reclaim my Judaism. With Kuwait occupied and the Iraqis at his border, King Fahd did the practical thing. We shipped out, but there was still the issue of classification. Normally the dog tags of Jewish servicemen are imprinted with the word “Jewish.” But Defense, fearing that this would put Jewish soldiers at further risk should they be captured on Iraqi soil, substituted the classification “Protestant B” on the tags. I didn’t like the whole idea of classifying Jews as Protestant-anything, and so I decided to leave my dog tag alone. I figured if I were captured, it was in G‑d’s hands. Changing my tags was tantamount to denying my religion, and I couldn’t swallow that. In September 1990 I went off to defend a country that I was prohibited from entering. 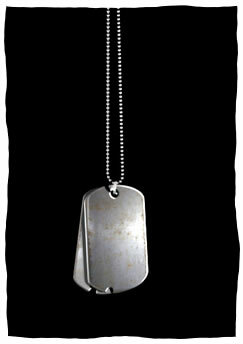 The “Jewish” on my dog tag remained as clear and unmistakable as the American star on the hood of every Army truck. Simkatoro turned out to be Simchat Torah, a holiday that hadn’t registered on my religious radar in eons. Services were held in absolute secrecy in a windowless room in a cinder block building. The chaplain led a swift and simple service. We couldn’t risk singing or dancing, but Rabbi Ben Romer had managed to smuggle in a bottle of Manischewitz. Normally I can’t stand the stuff, but that night, the wine tasted of Shabbat and family and Seders of long ago. My soul was warmed by the forbidden alcohol and by the memories swirling around me and my fellow soldiers. We were strangers to one another in a land stranger than any of us had ever experienced, but for that brief hour, we were home. The wind was blowing dry across the tent, but inside there was an incredible feeling of celebrationOnly Americans would have had the chutzpah to celebrate Simchat Torah under the noses of the Saudis. Irony and pride twisted together inside me like barbed wire. Celebrating my Judaism that evening made me even prouder to be an American, thankful once more for the freedoms we have. I had only been in Saudi Arabia a week, but I already had a keen understanding of how restrictive its society was. Soon after, things began coming to a head. The next time I was able to do anything remotely Jewish was Chanukah. Maybe it was coincidence, or maybe it was G‑d’s hand that placed a Jewish colonel in charge of our unit. Colonel Lawrence Schneider relayed messages of Jewish gatherings to us immediately. Had a non-Jew been in that position, the information would likely have taken a back seat to a more pressing issue. Like war. But it didn’t. When notice of the Chanukah party was decoded, we knew about it at once. The first thing we saw when we entered the tent was food, tons of it. Care packages from the States—cookies, latkes, sour cream and applesauce, and cans and cans of gefilte fish. The wind was blowing dry across the tent, but inside there was an incredible feeling of celebration. As Rabbi Romer talked about the theme of Chanukah and the ragtag bunch of Maccabee soldiers fighting Jewry’s oppressors thousands of years ago, it wasn’t hard to make the connection to what lay ahead of us. There, in the middle of the desert, inside an olive green tent, we felt like we were the Maccabees. If we had to go down, we were going to go down fighting, as they did. We blessed the candles, acknowledging the King of the Universe who commanded us to kindle the Chanukah lights. We said the second prayer, praising G‑d for the miracles He performed, in those days and now. And we sang the third blessing, the Shehecheyanu, thanking G‑d for keeping us in life and for enabling us to reach this season. We knew war was imminent. All week we had received reports of mass destruction, projections of the chemical weapons that were likely to be unleashed. Intelligence estimates put the first rounds of casualties at 12,500 soldiers. I heard those numbers and thought, “That’s my whole division!” I sat back in my chair, my gefilte fish cans at my feet. They were in the desert, about to go to war, singing songs of praise to G‑d who had saved our ancestors in battle once before. The feeling of unity was as pervasive as our apprehension, as real as the sand that found its way into everything from our socks to our toothbrushes. I felt more Jewish there on that lonely Saudi plain, our tanks and guns at the ready, than I had ever felt back home in synagogue. That Chanukah in the desert solidified for me the urge to reconnect with my Judaism. I felt religion welling up inside me. Any soldier will tell you that there are no atheists in foxholes, and I know that part of my feelings were tied to the looming war and my desire to get with G‑d before the unknown descended in the clouds of battle. It sounds corny, but as we downed the latkes and cookies and wiped the last of the applesauce from our plates, everyone grew quiet, keenly aware of the link with history, thinking of what we were about to do and what had been done by soldiers like us so long ago. Doron Kornbluth is a bestselling author of Why Be Jewish?, Raising Kids to LOVE Being Jewish, and the newly released Cremation or Burial? A Jewish View (all by Mosaica Press). A renowned international lecturer, Doron speaks in over 50 cities a year to all types of audiences, on many subjects. Doron is also an inspirational licensed Israeli Tour Guide who offers fascinating and inspirational tours to individuals, families and groups. For more information, visit his website or click here to purchase his latest book. Greetings. I am Debra Darvick, the author of This Jewish Life, Stories of Discovery, Connection and Joy, the book in which Protestant B. Not (the story's true title) appears. An NPR intern found this story while doing research for Chanukah Lights, a yearly broadcast It will air this Chanukah. Thanks to Mr. Kornbluth for playing a part in this. A word about my process. I interviewed Jews across North America about their most transforming Jewish experience. Working from often 15 pages of notes, I retold the story in the first person, assuming my interviewees' and own words. Each story was read by the subject before giving permission to publish, including Mr. Neulander. An important footnote The decision to send the U.S. military (especially as normally constituted, with women, Jews, etc.) to defend Saudi Arabia (instead of leaving the task to the region's all-male, all-Moslem forces) caused a former ally of the U.S. to switch sides and try to kill Americans, including in the September 11th attacks. I realize that Chabad refuses on principle to consider the possibility that drawing attention to the presence of Judaism can provoke antisemitism, but can we at least acknowledge that offending local sensibilities can lead to terrorist attacks that kill gentiles? Tom Gray .. hope you will read this Tom Gray my children and grandchildren live in the USA so I am tied to your land and what happens to you there. When the rally was held here in Jerusalem for Donald Trump, I went, not able to vote of course , but concerned for the future of my own immediate family and all those who live in the USA. The media took a photo of me which was used in all our Israeli tv shows about the elections, with me wearing a huge smile, a bright red shirt and holding in one hand the flag of America and the other hand holding the flag of Israel. In the background were the walls of the old city . very special photo. So have some idea of the importance of America to us here in Israel and still hope that more American Jews will return home to join us anyway. This story reminded me of Thailand and Vietnam, 1972 I understand the story above much better having had been in his shoes. In 1972 I was a young and dumb Airman 1st Class with the 49th TFW from Holoman AFB in New Mexico. Nixon sent the entire wing to counter the NVA "Easter Offensive". I was feeling home sick and missing my new bride when I saw a tall man get off a plane on the run way in Takli. He wore a blue and white baseball cap with a giant Star of David on the front in gold. I walked over and saw the Rabbi tables on his blouse. " Du bis a Rav?" I asked. He looked at me and smiled saying " Du bis a Yid". We both laughed. He was Rabbi Levin, the Regional Roving Rabbi of Thailand. It was great seeing a Rav in the middle of nowhere. He asked if I needed anything and I said I would kill for gefilta fish!. He laughed and got my name, rank and unit. Years ago I read about a synagogue in Iraq. It was found by a Jewish chaplain. It was full of garbage. They dug through and found a sefer Torah scroll. I never heard what happened to that synagogue. Is there any documentation about it? israel the galut has blinded the eyes of jews who live there to their actual reason we exist: To do tikkun olam, to live in our land. I don't want to go into this now as it will take away from the reason for this article, which is a very special story. Tom Gray you are right. I don't have ties to America like your family who fought for the land they love. May I tell you what we need here, we need more Jews. King David was fighting wars before there was a galut. Bring your skills and your passions and your courage and come and defend your homeland. I live in an area where tourists come through all the time, local and from the galut. I love talking to them and inviting everyone to make aliyah. I love meeting more Jews and hearing their stories. we all do here in Israel. You have no idea how much we enjoy to meet Jews from all over. ruth I can understand you patriotism. I have been in Europe lately and see Chabad dressing like Chabad. I have been in Israel lately, I see heavy secularism, no kippas, no Jewish clothing. A long time ago on my first stay in Israel, upon leaving, a kibbutznik paratrooper told me not to worry about making aliyah, but to make money and send donations. Right today as I write, Israel does not need another firefighter. They could use a fire water bomber. And yes Israel needs to increase its Jewish population over Arabs for future political elections. It's hard to do support both causes at the same time. proud to be an israeli While I appreciate greatly jewish soldiers who are not cowards in the time when jews in europe are hiding their religious clothes not to stand out. Why are you all so proud of being Americans???? Israel is the holy land of the jews only. I am so proud to be born here in israel on a moshav habonim that my late father was one of the founders of this moshav. What is america, 200 years old .hello jews we are thousands of years old, our roots are Jerusalem not USA. This really troubles me. Jews must come to israel. you do see the increase of anti Semitism and rise of Muslim terror. Be a proud Jew in Israel. You are so lucky to have been born in Israel. I have struggled from childhood to learn Hebrew. I went to Hebrew school for a year and learned the alef bet but it takes me a whole minute to sound out a word. I certainly cannot understand it when I hear it, except for a few words like "baruch" and so on. I have taken a college course in Hebrew--twice, from two different professors--and got a B but did not learn to speak it. I have used language records and have taken whatever courses were available from Hillel and from the Jewish community center, and it still takes me an hour to say the Shabbat Amidah, which others can whip through in five minutes. I am so ashamed of being too stupid to learn any language other than English.